The graphic objects on a canvas are created by using the default stroke and fill color. However, you can use colors other than the default color for creating the graphic objects. The fillStyle property is used to define a color that will be used to fill any closed shape drawn on the canvas. The default value of the fillStyle property is solid black. The following syntax is used to apply fill style on a graphic object: fillStyle="color"; In the preceding syntax, you can specify the color as red, green, or blue. In addition, you can also specify the hexadecimal value of the color ranging from 000000 to FFFFFF. 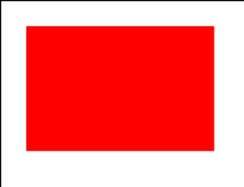 The preceding code creates a rectangle of size 150 x 100 filled with red color at the position, (20, 20), on the canvas, as shown in the following figure. The strokeStyleproperty is used to set the outline color of a shape drawn on the canvas. The default value of the strokeStyleproperty is solid black. The following syntax can be used to apply stroke style on a graphic object: strokeStyle="color"; In the preceding syntax, colorspecifies the name or hexadecimal value of the color. 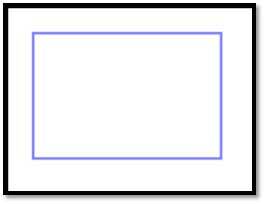 The preceding code will create a rectangle of size 150 x 100 with its outline colored in blue at the position, (20, 20), on the canvas, as shown in the following figure. Once you have drawn a shape on the canvas, you may want to make it more stylish by casting a shadow on it. To cast a shadow of a graphic object on the canvas, you need to specify the color of the shadow. In addition, you need to specify how blurred you want your shadow to be. The shadowColorproperty is used to set the color for the shadows appearing on the graphic objects and the shadowBlurproperty is used to set the blur level for the shadows. You can use the following syntax to use the shadowColorproperty: shadowColor="color"; In the preceding syntax, colorspecifies the color that will be applied on shadows. The default value of the shadowColorproperty is solid black. You can use the following syntax to define the shadowBlur property: shadowBlur=number; In the preceding syntax, numberspecifies the blur level of the shadow. It can accept the integer values, such as 1, 2, and 20. Its default value is 0. In the preceding code, the blur level of the shadow of graphic objects is set to 40. In addition, the shadow color for the first rectangle is set to black and the shadow color for the second rectangle is set to blue. The output derived by using the shadowBlurand shadowColor properties is displayed in the following figure. position: Specifies a value between 0.0 to 1.0 to represent the position from where to start and end the gradient color. color: Specifies the color that needs to be applied on the respective position. The addColorStop()method is used along with the createLinearGradient()or method to display the createRadialGradient() gradients. x0: Specifies the x-coordinate of the start point of the gradient. y0: Specifies the y-coordinate of the start point of the gradient. x1: Specifies the x-coordinate of the end point of the gradient. y1: Specifies the y-coordinate of the end point of the gradient. After creating the linear gradient object, you need to create the gradients by using the addColorStop()method. Fill the graphic object with the linear gradient by using the fillStyleproperty. -Apply the linear gradient on the outline of the graphic object by using the strokeStyle property. 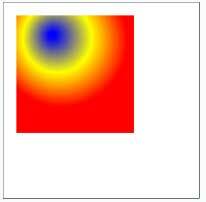 In the preceding code, a gradient object is created by using the createLinearGradient()method. Further, the addColorStop()method is used to specify different colors to the gradient object, and then, the gradient object is passed to the fillStyle property. To shade the rectangle in three different colors from left to right. The output derived by using the createLinearGradient()method is displayed, as shown in the following figure. y0: Specifies the y-coordinate of the start point of the gradient. (x0,y0) specifies the center coordinate of the first circle of the cone. y1: Specifies the y-coordinate of the end point of the gradient. (x1,y1) specifies the center coordinate of the second circle of the cone. Fill the graphic object with the radial gradient by using the fillStyleproperty. Apply the radial gradient on the outline of the graphic object by using the strokeStyle property. 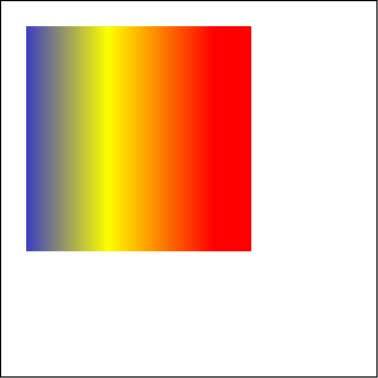 In the preceding code, a gradient object is created using the createRadialGradient()method. Further, the addColorStop()method is used to specify different colors to the gradient object and then, the gradient object is passed to the fillStyleproperty to shade the rectangle in three different colors along the radius given for the circle. The output derived by using the createRadialGradient()method is displayed in the following figure. The createPattern()method is used to create a pattern by displaying an image repeatedly on a canvas in the specified direction. For example, consider the following image. If the preceding image is repeated vertically and horizontally, you can create a pattern, as shown in the following figure. 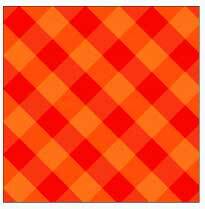 img: Specifies the image or video to be used to create a pattern. repeat: Specifies that the pattern should be repeated horizontally and vertically. repeat-x: Specifies that the pattern should be repeated horizontally. repeat-y: Specifies that the pattern should be repeated vertically. no-repeat: Specifies that the pattern should be displayed only once. The preceding code snippet repeats the pattern.png image horizontally and vertically in the rectangular area on the canvas, when the user clicks the Repeat button, as shown in the following figure. The canvas element in HTML provides a drawing surface that allows you to add text, shapes, and images to the websites dynamically.